Roots of The Word "Hell"
Is Anyone Tormented in Sheol? Hades: In Greek mythology, Hades, Zeus and Poseidon were brothers. Zeus ruled the sky, Poseidon the sea, and Hades the underworld - the dark regions where disembodied spirits were supposed to dwell. This is probably why the New Testament writers chose to use the Greek Hades in place of the Hebrew Sheol as Peter did in Acts 2:27. Much of the confusion about hell has arisen from the fact that several separate and distinctive words (Sheol in Hebrew, and Hades, Gehenna, and Tartarus in Greek), were usually translated into the single English word 'hell' commonly believed to be the place of the damned. However, what is particularly disturbing is that all four original words are proper nouns and should have been left untranslated. We have taken several different proper names from two different languages, decided that, in many instances, they have to mean hell that we associate with the place of the damned, and then translated them as such, without a single care as to what the original names meant, how they were used, and what the differences between them were. This is a commentary, not a translation and not the only time that we have been presented with opinions passed off as 'translation'. And, if I may remind the reader - it is ONLY the original Hebrew and Greek manuscripts that were inspired and inerrant - The same cannot be said of the thousands of copies and translations made through the ages. Therefore, if the King James or any other translation says "hell", but the original Hebrew says Sheol, it is Sheol that the original authors wrote, and it is Sheol not hell, that we have to carefully examine. However, since 'hell' occurs so many times in our English Bibles, perhaps we should take a close look at the etymology of this English word. Did the word really mean a place of fire and brimstone, or is that concept also a recent invention? The English word 'hell', that conjures up such ghastly visions, was actually derived from the Old English hel, helle (Barnhart Concise Dictionary of Etymology, page 348), and probably stretches back to the Anglo-Saxon helan - to cover or hide. The word "helmet" - a covering for the head, and the word "heal" - also a form of being covered over, are both derivatives. I also understand that people in England spoke of storing their potatoes "in hell" for the winter, which simply meant storing them in a covered hole in the ground. And, as Bible commentator Adam Clarke noted, the tiling or slating of a house was called heling in some parts of England (particularly Cornwall), as were book corers in Lancashire. eis Hadou. 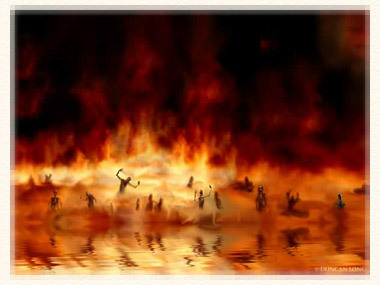 The word "hell," in English, now commonly denotes "the place of the future eternal punishment of the wicked." This sense it has acquired by long usage. It is a Saxon word, derived from helan, "to cover," and denotes literally "a covered or deep place" (Webster); then "the dark and dismal abode of departed spirits"; and then "the place of torment." As the word is used now by us, it by no means expresses the force of the original; and if with this idea we read a passage like the one before us, it would convey an erroneous meaning altogether, although formerly the English word perhaps expressed no more than the original. If the translators were of the opinion that the proper name Sheol really meant 'hell' then it should never have been rendered as anything else. Yet, and this should give the serious Bible student pause for thought, the KJV only uses 'hell' in place of Sheol 31 times. It translates Sheol into pit 3 times, and into grave 25 times. This I do not understand. There is a huge difference between the idea of a hole in the ground and the traditional concept of hell. The only explanation is that they chose the English word that best fit their interpretation of the text. For example, Sheol was rendered pit in connection with Korah, Dathan, and Abiram's rebellion. The earth opened her mouth and swallowed them and their fellow rebels, which means they went down alive. Since no one is supposed to go down alive to Sheol and it is certain they were not buried alive in a grave, the translators probably scratched their heads and came up with 'pit. Also note the story of Saul and the spirit of Samuel. When Saul saw the host of the Philistines gathered for war, he was very afraid, and enquired of the Lord. However, since Saul had already fallen out of favour, the Lord did not answer him. Saul then turned to the witch of Endor and told her that he wished to consult with a spirit. Not just any spirit, but the spirit of Samuel the prophet. Note how often the words "bring up", or "come up" are used in the account. Note the third time Sheol was rendered as pit is in the book of Job where, in the space of four short verses, Sheol is translated first as grave, then as pit. The reasoning behind using two different English words is well beyond me.. The fact that they deliberately chose to use Sheol indicates that they were speaking of something more than a literal grave or burying place. The difference being that a grave is a particularly shaped hole dug for the specific purpose of burying a body, whereas Sheol was (and is) a holding place for the spirits of the dead. There are only seven references to Sheol in the Pentateuch - the first four attributed to the patriarch Jacob. Unless we think it possible that Jacob believed he was going to a place of fire and brimstone, we have to accept that Sheol/Hades bears no resemblance to the popular concept of hell. A careful reading of some of the Psalms shows that the psalmist was very convinced that he would be rescued from Sheol. Although the first quote below is a prophecy concerning our Lord's three days in the tomb, it is unlikely that David was aware of that, but was writing about his own salvation from Sheol. In the book of Hosea, God spoke of ransoming Israel from the power of Sheol. However, there is no rescue from the traditional idea of an eternal hell. No One is Consigned to Sheol Forever. However perhaps the most telling of all passages is 2 Peter 2:9, where the apostle very clearly says that the unrighteous are being held until the day of judgment. Erwin W. Lutzer Pastor Emeritus of The Moody Church made the following comment on the John Ankerberg Show..
Pastor Lutzer has come to the conclusion that because some people are 'tormented in Sheol and others seem to be fine about going there, Sheol must have two compartments. The problem being that not a single verse in the Old Testament says, or even implies that anyone is tormented in Sheol. In all likelihood, this idea stems from Jesus' parable about Lazarus who eventually reached Paradise and the rich man who wound up in agony in Hades commonly believed to be Jesus' vivid and very graphic description of conditions in hell.. However, if this is true we are faced with numerous serious difficulties. See Chapter 6 for details. Sheol is presented in the Old Testament- not as a place of fire, brimstone, and torment but as place of darkness, silence, and forgetfulness, where there is no work, knowledge or wisdom. Note: We cannot use Jonah as an example of people being afflicted in Sheol as he said he was. Jonah's experience was a type (See Typology) of the death and resurrection of Christ. Besides which, the prophet was alive in the belly of a whale, not dead in Sheol. Jonah's words may simply have been the extreme distress of a man who was not only in dire straits physically, but in mental anguish as well considering he had tried to run away from the task given him by the Lord. Also Note: The KJV version of 2 Samuel 22:6 has David saying "The sorrows of hell compassed me about; the snares of death prevented me". However the word rendered "sorrows" actually means a cord. This is pretty much what the KJV, the ESV and most other Bible versions say. However, it is not what the Greek says. Literal translations tell us that the angels were cast down to Tartarus. This phrase translated from a single word - tartarosas. Once again, we have taken a proper name and interpreted it according to preconceived bias. In Greek mythology Tartarus is both a deity and a region of the underworld - a subterranean abyss lower than Hades where the Titans were confined. Note that the Greek Titan is linguistically linked to the Chaldean Sheitan, the Hebrew Satan and the Hindi Shaitan, all of which mean the devil. Also Note that there is no mention of any human going to Tartarus which indicates that it is a different place from Sheol/Hades and possibly reserved for the fallen angels, kept there only until the judgment. So, even if convinced that Sheol and Hades do not denote a place of torment in the future world, most traditionalists claim that Gehenna does . The John Ankerberg Show. What Are Sheol and Hades. Also note that Samuel sounded positively peeved when he was summoned by the woman at Endor at the request of king Saul. He asked why Saul had 'disquieted' or 'troubled' him? (1 Samuel 28:15). Christians will commonly say that Saul was not communicating with Samuel himself, but a demon disguised as Samuel. However, this is not possible. No demon would have been able to so accurately prophesy what Saul's fate would be the very next day, and tell Saul the exact reason this would happen (because he failed to obey the Lord and destroy Amalek). However, the Bible never says that it is impossible to communicate with the spirits of the dead.